In a surprising move, NC-92 Rep Charles Jeter announced his resignation from the General Assembly on Monday. Citing the need to focus more on family, Jeter's sudden departure leaves Republicans without a candidate for the seat this November. Republican party rules state that the county Executive Committee will pick Jeter's replacement. Jeter's former 2-time primary opponent, Tom Davis, is wasting no time campaignign to fill out the remainder of Jeter's term and for the opportunity to run for the seat as the party's candidate this November. To that end Davis appears to already have an impressive list of support - puting out this statement on Monday. Technically, the local GOP big wigs could select anyone they want, but picking someone other than Davis would likely not be a path to success in November. As aShortChronicle reported after the primary this spring, Davis actually won the precincts in the Republican heart of NC-92 here in North Mecklenburg. Jeter squeaked out the victory by running up the margins in the southern, more Democratic, part of the district where there are fewer Republican voters but Davis was less well known. However, the dynamic will be different in the general election this fall when Democrat Chaz Beasley is also on the ballot. During the primary, Davis ran on an anti-toll platform that resonated with voters in North Mecklenburg - particularly those who saw Jeter's late conversion to the anti-toll effort as somewhat suspect. Beasley is also running as an anti-toll candidate. The overall November election will be driven by the Presidential race as much or more than anything, but a candidate in the NC-92 race that doesn't pull strong anti-toll support will be at a distinct disadvantage. NC-92 is one of the few truly competitive districts in the whole state, so every vote truly does matter here. 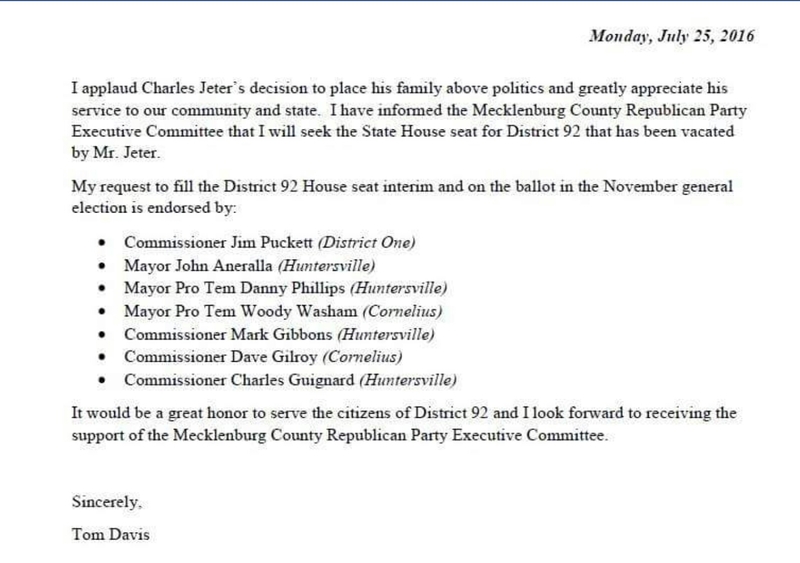 What could prove interesting in picking Jeter's replacement is the makeup of the NCGOP members who may do the picking. Throughout the anti toll fight, the NCGOP has run cover for pro-toll electeds. The issue has divided Republican and consevative activists in North Mecklenburg in particular. For replacing Jeter for the remainder of his current term, Ballotpedia.org outlines the NC procedure this way. "If there is a vacancy in the North Carolina General Assembly, the governor is responsible for appointing a replacement. When making an appointment, the governor must make a decision from a list of recommended candidates submitted by the political party committee that last held the vacant seat. The appointment must be made within seven days of receiving a list of recommended candidates. The person selected to the seat serves for the remainder of the unfilled term." What's the likelihood of McCrory pushing to get that list quickly? What's the likelihood the NCGOP would put an anti-toll person on the list? To replace Jeter on the ballot gets a bit more murky. G.S. 163-114 says the "County executive committee of political party in which vacancy occurs" - meaning the MeckGOP Exec Committee - is the body responsible for picking the replacement candidate. In fact it is just the subset of this committee from NC92. If this group were to pick a candidate it's unclear if Davis would get the nod. There are a number of pro-tollers in the bunch who would likely fight it. However, this section also references a 120 day window for replacing a candidate. Since it is less than 120 days until the election, it's unclear if Jeter can even be replaced on the ballot at this point - effectively leaving Republicans without a candidate. If the local GOP establishment decides to continue its pro-toll political cover, it is possible they could pick someone other than Davis to replace Jeter or pick nobody at all to send to the Governor. If they can't replace Jeter on the ballot for November, or don't fight to be able to do so then that makes winning an almost insurmountable climb for any Republican. However, this would all prove only one thing. They would rather lose a House seat, than cross those higher up the political food chain who they've been covering. Clarification: An earlier version of this post incorrectly said the MeckGOP executive committee was responsible for these selections. Per discussion with Mecklenburg BOE Director, Michael Dickerson, only MeckBOE members in NC-92 will pick. They would only be responsible for the canddiate replacement if it's allowed. He has a question out to the State BOE regarding the 120 day window. Last week marked one month since NCDOT lowered the speed limits along the length of Davidson-Concord Road on Davidson's east side. Regular readers will remember the story which was covered extensively at aShortChronicle. After publishing citizen video coverage of how harrowing the road had become, the long simmering issue of high speeds and dangerous pedestrian crossings finally got the attention it deserved. Television media covered the issue and State elected officials got involved. Frustrated citizens then descended on Town Hall in May and June. At the June meeting something unexpected happened. NCDOT engineer Scott Cole did a 180 on the plan the agency had published just days before for the most dangerous part of the road for pedestrians. On June 17th, the speeds were lowered and new signs went up. As part of the deal to get speeds lowered sooner, Davidson agreed to increased enforcement. Information provided by the Town shows a marked reduction in accidents along with increased enforcement in the corridor during the one month after the speeds dropped. There were 6 citations and 5 warnings issued during that time frame and 1 accident. The crash took place on Davidson Concord Rd. where it intersects with Apollinaire Dr. It was a single car accident and the driver lost control of her vehicle when swerving to avoid hitting an animal that ran out in front of her. There was 1 warning issued during that time frame and 0 citations. There were 4 accidents. At the June meeting NCDOT argued against lowering the speed in the pedestrian heavy area because it could actually make it more dangerous. The less than obvious logic was that an artificially low speed limit might lead to inconsistent driver speeds making it more uncertain when crossing the road. When asked last week for a comment on the changes after a month of data, here's what the DPD had to say. Based on the lower number of accidents it would appear DPD rather than NCDOT is right on this one. Several weeks ago, I penned a column on the full slate of financial issues facing the Town of Davidson, and for the first time since starting these columns for the Herald Weekly, the Town officially pushed back on how things were portrayed. When it came to the town budget for FY2017, the Town objected to the use of the colloquialism “spending every dime” when referring to its spending plan. The town argued that it wasn’t “spending” every dime because they were “putting $200,000 into a capital projects fund to meet the town’s future capital needs”. Needless to say, the town didn’t give taxpayers any of their money back in the new budget. Readers can decide for themselves if there’s a difference in “spending” taxpayer money now versus keeping taxpayer money for spending later. The Town also didn’t like the point made in that previous column regarding use of fund balance (aka its savings account) to pay for the long awaited 2nd fire station. Even though documents passed out to the public showed fund balance as a source of funding for the fire station, the town wanted it clarified that it now planned to pay for the second fire station with installment financing but could use fund balance to pay the debt service. How that’s materially different is a bit of a head scratcher, but it seems to be in the same vein as the first point. It’s easy to split hairs over wording. It’s harder to actually address the points made on spending and priorities. As Davidson continues discussions on capital spending plans (Commissioners had a quickly scheduled, “special meeting” billed as a “mini-retreat” to discuss the topic on July 11th) here are a few ideas Commissioners could use to pay for some of their desired projects without reflexively raising property tax rates which are already the highest in North Mecklenburg. Ask Davidson College to pay more of its fair share towards the services it receives. A 2014 study of fiscal impact analysis commissioned by the town from consultancy TischlerBise showed that Davidson College receives almost $200,000 per year more in services from the town than it pays. Due to being a non-profit institution the college pays almost nothing, yet it receives a tremendous amount of service from the town – particularly from its fire department. The Town wants a new downtown fire station. Davidson College could easily donate land for this project. The College should also be asked to make a payment in lieu of taxes to offset its outsized use of fire services or to finance some of the debt to build a new station. Implement a special assessment district to help pay for parking. When the Red Line was all the rage a few years ago, Davidson Town Hall was more than willing to seek approval from local commercial real estate owners in the town center to help finance it. The Town should be equally as willing go seek a Special Assessment District to help pay for a multi-million parking facility. Frankly, if downtown commercial property owners and businesses who will benefit the most from such a facility are not willing to help pay for it, then maybe it’s not all that needed. Make the Affordable Housing program self-funding. 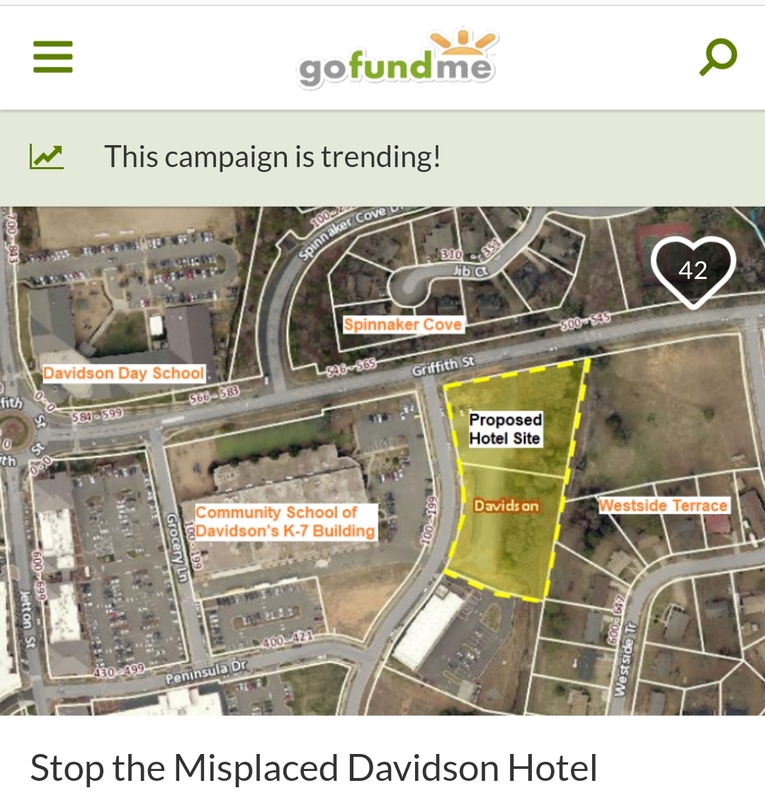 Davidson is in the process of its first ever RFP for an affordable housing project. This one is on Town owned land in the Bailey Springs neighborhood. Based on a conversation with the new town attorney, Cindy Reid, it seems likely the town may give the land away for the project. Regardless, the RFP did not require payment for the land. Rather than possibly taking on debt for the Affordable Housing program, the Town should commit to making the controversial program self funding through payments in lieu from developers and no free land from the town for its projects. All of these options and many others are harder than simply taking on debt and raising taxes, but that’s what elected officials signed up for when they ran for office. It will be interesting to see which direction Davidson’s Board chooses. Do we really live in a democracy? The common answer to that question that makes everyone feel good has long been “yes”. Democracy, or governing by the “will of the people”, sounds great. But, the real answer to that questions is “no”, or at best a “maybe” or “kinda-sorta”. We are definitely not a small-d democracy where everyone votes directly on everything, and the majority always wins. If we were, then we wouldn’t have things like the Electoral College when selecting a president – a system where winning the popular vote does not guarantee victory. Also the US Senate wouldn’t be set up the way it is with each state having the same number if Senators regardless of population. The Senate wouldn’t allow something like the filibuster where one person can effectively shut down legislation. No, we don’t have direct democracy in this country. Instead we have that “maybe” or “kinda-sorta” version of democracy called “representative democracy” where voters select individuals to represent them in the decision making process. Picking those people is the voter’s responsibility, but we are often playing in a rigged game. With both major parties hosting their national conventions in the coming weeks more focus than at any time in recent history is on the process of nominating candidates for the Presidency of the United States. Republicans started out well when it comes to a democratic process bosting a whopping 17 candidates seeking the party’s nomination. By the end however they’ve ended up with a candidate, Donald Trump, who is so unpopular among many in the party establishment that there is a simmering #NeverTrump movement of party officials who would like nothing more than to figure out how they could steal the nomination from him. They pursue this even though he is a candidate who helped lead to record setting turnout all across the country in the Republican Primary. They’ve even been actively recruiting for a candidate, any candidate, who didn't even run this election cycle because the second place candidate, Ted Cruz, is almost equally as unpopular. What the actual voters want is a seeming afterthought. Things on the Democrat side, aren’t much better though. Bernie Sanders made the race for the Democrat nomination much more competitive than many thought possible. However, in the end he did not have much of a chance because of something patently undemocratic about the process – superdelegates. Superdelegates are high ranking current and former party officials who are unbound by the primary voting results. They can support any candidate regardless of how the voters vote. Hillary Clinton’s overwhelming lead among superdelegates gave her a sense of inevitability. Yes, Clinton won the overall popular vote in the primary making it more “democratic”, but in an endeavor like politics a manufactured sense of inevitability can become a self fulfilling prophecy. Last week, the Pew Research Center released a telling set of data showing how all this has led to a breakdown in the candidate selection process resulting in more “unsatisfying” candidates than have been seen in over two decades. Both Hillary Clinton and Donald Trump are the least “satisfying” candidates since 1992. Trump matches the low water mark of 40% set by Republican George H.W. Bush that year, and Hillary Clinton also has the lowest satisfaction level for a Democrat since that same election. Somewhat ironically, her 43% satisfaction rating as a candidate bests only that of her husband Bill Clinton who had an abysmal 33% in his first run for the Oval Office. It may come as a surprise to many, but political parties are actually private organizations. They are free to set up their rules as they wish and select their nominees effectively however they want. Their goal is to win elections so that their people can become the arbiters of the power that comes with elected office. Being small-d democratic is somewhere way down on the priority list. Unfortunately for voters, this election cycle the processes in both parties have resulted in suboptimal candidates. That leaves the question, do we live in a democracy? This post first appeared in this week's editionof the Herald Weekly at HuntersvilleHerald.com. The Davidson Board of Commissioners will meet for something called a "mini-retreat" on Monday evening at 5pm. "Retreat" is typically just the fancy name for a meeting held outside Town Hall. Really, there's nothing all that special about them. In fact the only "practical" reason for having them is to keep away the prying eyes of the public. To accomplish this, "retreats" are sometimes held far outside of town limits in places like Southern Pines or Blowing Rock. Is this discussion a precursor to the long discussed General Obligation Bond effort? You will have to attend to find out. Per Town Hall, the meeting is open to the public but will not be recorded. NOTE: An earlier notice said the meeting would be on Grey Road. The information posted above is the most current. 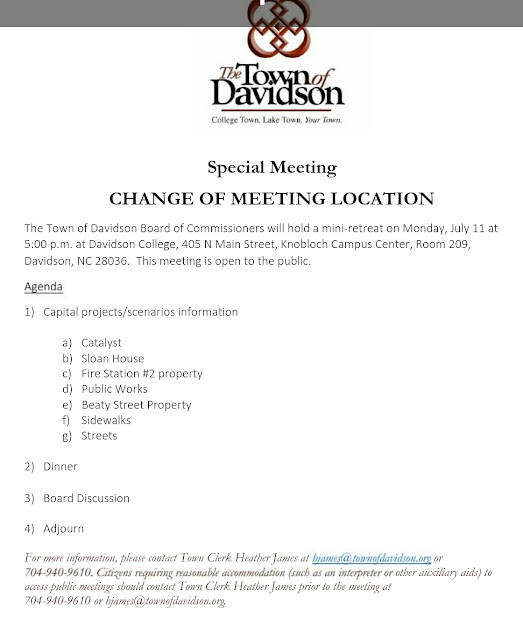 The "1st Tuesday" informal board meeting is cancelled this month in Davidson. That's per a Friday press release from the town. What residents don't know is what would have been talked about if the meeting had been had. Agendas for these 1st Tuesday meetings typically aren't published. They are billed as "informal" meetings where Commissioners discuss various topics but no votes are taken. Sparse minutes are made available after the fact. The curtain was pulled back on these meetings last month when the meeting had to be called as a "special" meeting due to a date change. Special meetings require agendas per state statute and the one for June 6th revealed that the 1st Tuesday meeting (this one being held on a Monday) actually discussed important items. But when the Board got to the second part of the agenda, the June meeting had running video cut off - preventing citizens from viewing. If Davidson is looking to turn over a new leaf when it comes to transparency, one idea would be to set town policy to record all town controlled meetings where there is a quorum of Commissioners. That would close the "transparency black hole".